Current guidelines recommend treating metabolic acidosis in patients who have CKD and serum total CO2 (TCO2) < 22 mM with Na+-based alkali (1). Indeed, NaHCO3 improved metabolic acidosis in individuals with mean creatinine clearance of approximately 20 ml/min and slowed the rate of creatinine clearance decline from 5.93 to 1.88 ml/min per 1.73 m2 year (2). In addition, sodium citrate ameliorated metabolic acidosis in individuals with mean eGFR of 33 ml/min per 1.73 m2 and slowed the rate of decrease in estimated GFR (eGFR) (−1.60±0.13 versus −3.79±0.30 ml/min per 1.73 m2 per year) (3). Nevertheless, metabolic acidosis is most frequent in patients with CKD who have very low GFR (4); these patients are most at risk for untoward effects of Na+-based alkali therapy, including worsened hypertension and/or volume control. Because diets typical of industrialized societies have high ratios of acid-producing to base-producing proteins, the latter being mostly fruits and vegetables (5), adding fruits and vegetables might improve metabolic acidosis in CKD and avoid complications of added Na+. Hypertension-associated nephropathy is the second leading cause of complete kidney failure in the United States (6). Many patients with GFR < 90 ml/min per 1.73 m2 had GFR decline (3,7,8) despite BP reduction with renin-angiotensin system inhibition (3,7,8). Because metabolic acidosis improvement with Na+ citrate in patients with CKD preserved eGFR (3), fruits and vegetables might also preserve eGFR. Supporting this hypothesis, 30 days of fruits and vegetables and NaHCO3 equally reduced urine measures of kidney injury in patients with CKD stage 2 eGFR (60–89 ml/min per 1.73 m2) without metabolic acidosis (9). We tested the hypothesis that 1 year of fruits and vegetables or NaHCO3 has eGFR effects that are no different, improves metabolic acidosis, and reduces kidney injury when added to diets of individuals with CKD stage 4 (eGFR, 15–29 ml/min per 1.73 m2). All individuals came from outpatient clinics of Texas Tech University Health Sciences Center. Once identified, they continued routine medical care in their clinics but had investigative follow-up at a local community center associated with a food bank. BP, weight, and blood and urine samples were obtained at the community center. Body fluid analysis was done in investigator laboratories. Inclusion criteria for all patients were as follows: (1) nonmalignant hypertension; (2) eGFR (by Modification of Diet in Renal Disease equation ) of 15–29 ml/min per 1.73 m2; (3) plasma TCO2 < 22 mM; (4) no diabetes or cardiovascular disease on problem lists; (5) two or more primary care physician visits in the preceding year; and (6) age ≥ 18 years and ability to give consent. Exclusion criteria for all patients were as follows: (1) primary kidney disease or findings consistent thereof, such as ≥3 red blood cells per high-powered field or urine cellular casts; (2) history of diabetes or fasting blood glucose level ≥ 110 mg/dl; (3) current pregnancy, history of malignances, chronic infections, or clinical evidence of cardiovascular disease; (4) peripheral edema or diagnoses associated with edema, such as heart or liver failure or nephrotic syndrome; (5) plasma [K+] level > 4.6 mEq/L; and (6) taking or inability to stop taking drugs (other than angiotensin-converting enzyme [ACE] inhibitors) that limit K+ excretion. Earlier studies (3) suggested the need for 33 patients in each of fruits and vegetables, HCO3, and not-treated groups (minimum of 99 individuals followed) to achieve an 80% probability of seeing a P<0.05 difference among groups, assuming that NaHCO3 and fruits and vegetables were equally effective in eGFR preservation compared with those not treated. We limited analysis to the two randomized intervention groups: fruits and vegetables and HCO3. Figure 1 shows the cascade of study patient selection. Five hundred fifty-one individuals were identified from our clinic system as described (8) who met inclusion and exclusion criteria. Because identified patients were candidates for oral alkali therapy as per current guidelines (1) and because the county health program did not pay for Na+ citrate, we considered only the 416 candidates covered by the county program who could not afford Na+ citrate. Our laboratory studies showed that kidney protective effects of dietary acid reduction were most evident in animals with good BP control (11). These 312 individuals underwent our 6-month BP reduction protocol (12), which is intended to reduce systolic BP to < 130 mmHg. After 6 months, 141 had systolic BP < 140 mmHg, 127 of 141 still had plasma [K+] levels ≤ 4.6 mEq/L, and 111 of 127 still agreed to continue in the study. Cascade of the selection process for study patients. F+V, fruits and vegetables. “Not treated” patients were not considered in the reported analysis. Compared with the 400 (511−111) individuals initially identified who met inclusion and exclusion criteria but were not study candidates, these 111 individuals had lower standardized (for a family of four) monthly income ($1150 versus $1521) and slightly lower plasma TCO2 (19.4 versus 19.8 mM). Because the Kidney Disease Outcomes Quality Initiative recommends dietary alkali for patients with CKD who have metabolic acidosis and plasma total CO2 < 22 mM (1), we thought it unethical not to offer NaHCO3 to individuals unable to afford Na+ citrate. Because fruits and vegetables improved metabolic acidosis (13) in CKD, we felt ethically comfortable randomly assigning some individuals to receive fruits and vegetables; our institutional review board agreed. In our experience (3), about a third of individuals meeting these criteria do not take NaHCO3 at the recommended doses (1). All 111 patients were offered NaHCO3 tablets, but 35 declined. Thirty-six of the remaining 73 were randomly assigned to fruits and vegetables but no added NaHCO3, and 37 were randomly assigned to NaHCO3 and no added fruits and vegetables. Two of the latter chose not to participate because they moved and therefore had limited access to the participating community center. Because they were never enrolled and never followed, they were not included in the analysis. All study individuals kept 3-day diaries before and after the intervention from which potential renal acid load (PRAL), a measure of dietary acid intake, was calculated using a published equation (14). The 35 patients in the HCO3 group received oral NaHCO3 at 1.0 mEq/kg per day as scored tablets containing 10 mEq NaHCO3. Each received NaHCO3 to the nearest half tablet by ideal body weight (e.g., a 70-kg patient received 7.0 tablets per day). Ideal body weight was determined as 52 kg plus 1.9 kg for each inch of height over 5 feet for men and 49 kg plus 1.7 kg for each inch over 5 feet for women (15). The 36 patients in the fruits and vegetables group received fruits and vegetables free of charge, prescribed by a dietitian and distributed from the food bank in amounts to reduce PRAL by half, as done previously (9). Prescriptions emphasized base-producing fruits and vegetables (14), such as apples, apricots, oranges, peaches, pears, raisins, strawberries, carrots, cauliflower, eggplant, lettuce, potatoes, spinach, tomatoes, and zucchini. Individuals were not given specific dietary instructions, and they integrated the prescribed fruits and vegetables into their diets as they wished. To better assure that each patient in the fruits and vegetables group ate all the prescribed fruits and vegetables and did not spread them among members of these largely impoverished households, we gave the prescribed amount for each household person. For example, a four-person household, including the patient, received fruits and vegetables prescribed for the patient times four. Preliminary studies show that no one meeting eGFR and plasma [K+] criteria developed plasma [K+] levels > 5.0 mEq/L in response to the prescribed fruits and vegetables after weekly plasma [K+] measurements for 4 weeks. All received furosemide for BP control. All had systolic BP reduced toward <130 mmHg, with regimens including ACE inhibitors as recommended for albuminuric patients with hypertension (16). Eight-hour (8:00 a.m.–4:00 p.m.) urine net acid excretion (NAE) was measured in individuals asked to receive nothing by mouth after midnight and calculated from urine titratable acidity, ammonium (NH4+), and HCO3 ([NH4+] + [titratable acidity] − [HCO3]) (3) at baseline and 1 year after intervention. Also measured were systolic BP; venous plasma acid-base variables; plasma aldosterone; and 8-hour urine excretion of cystatin C, creatinine, aldosterone, tetrahydrocortisol (THF), tetrahydrocortisone (THE), Na+, and K+. Because plasma measurements of cystatin C and creatinine were not consistently done on the same days as the urine collections, we used calculated GFR measurements (10,17). The local institutional review board at Texas Tech University Health Sciences Center approved the protocol. Plasma and urine creatinine and urine albumin were measured with the Sigma Diagnostics Creatinine Kit (Procedure No. 555, Sigma Diagnostics) (12) with a coefficient of variation of 8%. Urine albumin excretion was measured as a general index of kidney injury (18). Plasma and urine cystatin C were measured using a particle-enhanced immunonephelometric assay (N Latex Cystatin C; Dade Behring, Somerville, NJ) with a nephelometer (BNII; Dade Bering) (8,19) with a coefficient of variation of 9%. The IRMA SL Series 2000 blood analysis system (Edison, NJ) measured venous plasma/blood pH and PCO2. Urine and plasma TCO2 were measured with ultrafluorometry (20), urine titratable acidity by correction to ambient plasma pH by NaOH addition, and urine NH4+ by the formalin titrametric (to ambient plasma pH) method (21). Urine N-acetyl β-d-glucosaminidase (UNAG) excretion, an index of kidney tubulointerstitial injury (22) and an index of kidney injury induced by dietary acid (11,23), was measured using a colorimetric assay (Boehringer Mannheim, Mannheim, Germany) (22) with a coefficient of variation of 9%. Urine TGF-β (UTGF), which reflects kidney injury induced by dietary acid in an experimental CKD model (11) and might be a mediator of hypertensive nephropathy (24), was measured using quantitative sandwich enzyme immunoassay (24) with a coefficient of variation of 8%. These urine indices of kidney injury (urine albumin, UNAG, and UTGF) have <1% variability when stored at −70°C up to 1 year after collection. Plasma and urine aldosterone were measured after extraction with Bound Elut C18 columns (Varian, Harbor City, CA) with a radioimmunoassay kit (Diagnostic Products Corp., Los Angeles, CA) (25). Urine THF and THE were measured by gas chromatography-mass spectrometry on a Hewlett-Packard gas chromatograph, using the THF/THE ratio to indirectly assess activity of 11β-hydroxysteroid dehydrogenase type 2 that metabolizes cortisone and prevents its access to the mineralocorticoid receptor, as done by others (26). Patient characteristics at the time of study enrollment were tabulated by percentages or are reported as mean ± SD. We first compared baseline characteristics between the two patient groups with a chi-squared test or a two-sample t test, as appropriate. The primary outcomes were cystatin C–estimated GFR and creatinine-estimated GFR in response to 1 year of oral fruits and vegetables or NaHCO3. Secondary outcomes included plasma and urine acid-base measures, urine excretion of cystatin C and creatinine, systolic BP, body weight, urine measures of kidney injury (urine albumin, UNAG, and UTGF), plasma [K+] and urine K+ excretion, and determinants of urine K+ excretion (including plasma and urine aldosterone and 11β-hydroxysteroid dehydrogenase type 2 activity, assessed as urine THF/THE ratio). The net changes (after − before) of urine measures of kidney injury after 1 year for each group were described by mean ± SD; they were considered with a one-sample t test. The differences and the net change differences between two groups within the fruits and vegetables and HCO3 groups were considered with a two-sample t test. A P value <0.05 indicates a statistically significant difference. SAS software, version 9.2 (SAS Institute Inc., Cary, NC), was used for the statistical analysis, and graphs were created using R 2.12.1 (R Core Development Team, 2010). Table 1 shows no difference in baseline general characteristics between the HCO3 and fruits and vegetables groups. 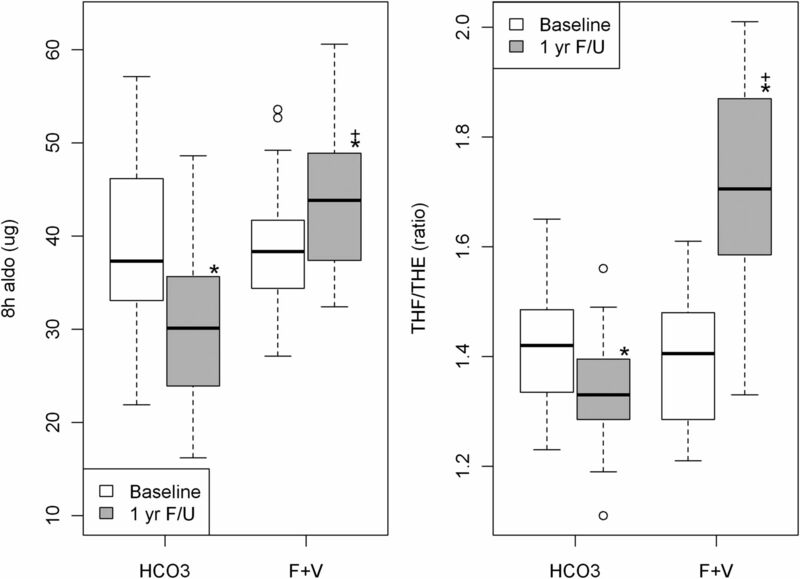 Figure 2 shows no difference in baseline plasma TCO2 between groups (P=0.52) but indicates that the 1-year compared with baseline values were higher in the HCO3 (P<0.01) and fruits and vegetables (P<0.01) groups. Plasma TCO2 at 1 year was higher in the HCO3 group (21.2±1.3 versus 19.5±1.5 mM; P<0.01) and fruits and vegetables group (19.9±1.7 versus 19.3±1.9 mM; P<0.01). Baseline 8-hour urine NAE did not differ between groups (P=0.89) and 1-year compared with baseline values were lower in the HCO3 (P<0.01) and fruits and vegetables (P<0.01) groups (Figure 3). One-year 8-hour NAE was lower in the HCO3 group than the fruits and vegetables group (P<0.01). Table 1 also shows that baseline PRAL was not different between groups but that 1-year PRAL was lower in the fruits and vegetables than the HCO3 group. PRAL was lower in patients receiving fruits and vegetables primarily because those patients substituted fruits and vegetables for acid-producing meats that they had previously purchased and were no longer eating at follow-up. 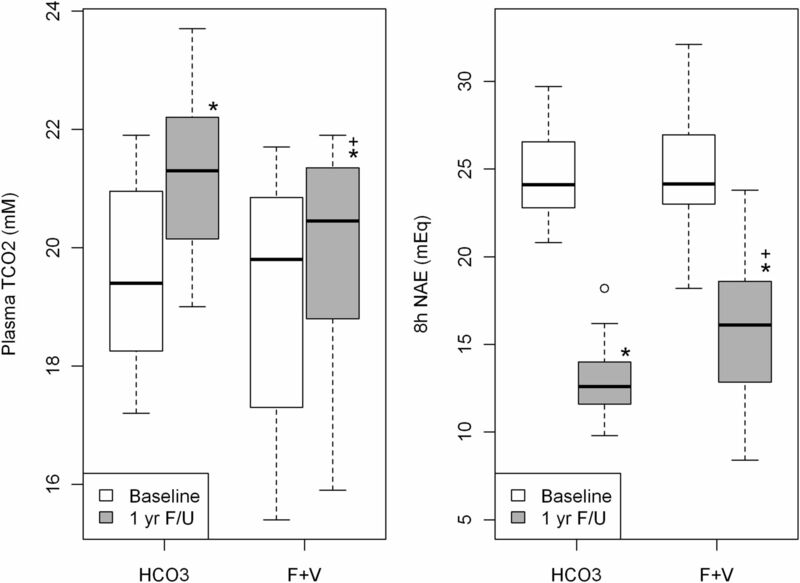 Box plots of plasma total CO2 (TCO2) (left) and 8-hour urine net acid excretion (8h NAE) (right) in patients with CKD stage 4 at baseline and 1-year follow-up. HCO3 recipients were given oral NaHCO3 at 1.0 mEq/kg lean body weight per day; the fruit and vegetable recipients were given fruits and vegetables in amounts designed to reduce potential renal acid load by half. The bottom and top of the boxes span the 25th and 75th percentile of data points. The dark bar within the box indicates the 50th percentile or median. The whiskers indicate 1.5 times the interquartile range from the lower and upper quartiles. F+V, fruits and vegetables; F/U, follow-up. *P<0.05 versus respective baseline; +P<0.05 versus respective HCO3 group. Box plots of 8-hour urine excretion of cystatin C (8h Cys Ex) (left) and of creatinine (8h Cr Ex) (right) at baseline and 1-year follow-up. The bottom and top of the boxes span the 25th and 75th percentile of data points. The dark bar within the box indicates the 50th percentile or median. The whiskers indicate 1.5 times the interquartile range from the lower and upper quartiles. F+V, fruits and vegetables; F/U, follow-up. *P<0.05 versus respective baseline. Systolic BP (Table 1) did not differ between groups at baseline; at 1 year, however, it was lower than its respective baseline in the fruits and vegetables group (P<0.01) but not the HCO3 group (P=0.88). One-year systolic BP was lower in the fruits and vegetables group than the HCO3 group (Table 1). Systolic BP was lower in patients receiving fruits and vegetables despite similar numbers of antihypertensive medications between the HCO3 and fruits and vegetables groups (3.2±0.7 and 3.0±0.7 medications, respectively; P=0.34) and similar doses of the only ACE inhibitor prescribed, enalapril (22.6±5.1 and 20.7±4.3 mg/d, respectively; P=0.21). Baseline body weight did not differ between groups (Table 1). By contrast, 1-year body weight was lower than its respective baseline in the fruits and vegetables group (P<0.01) but not the HCO3 group (P=0.87), and 1-year body weight was lower in the fruits and vegetables than the HCO3 group (Table 1). 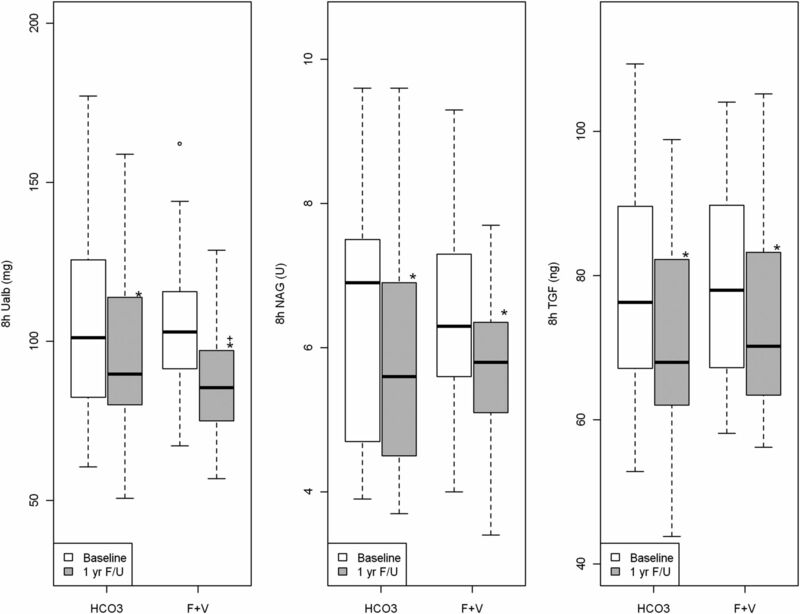 Baseline 8-hour urine excretion between the HCO3 and fruits and vegetables groups did not differ by group for cystatin C and creatinine (P>0.36) (Figure 3). One-year values were also not different between the HCO3 and fruits and vegetables groups for cystatin C (P=0.41) and creatinine (P=0.32). Although 1-year compared with baseline 8-hour urine cystatin C excretion did not differ between the HCO3 (0.64) and fruits and vegetables (P=0.74) groups, 1-year compared with baseline 8-hour urine creatinine excretion was higher in patients receiving HCO3 (P<0.01) and those receiving fruits and vegetables (P<0.01) (Figure 3). Baseline eGFR between the HCO3 and fruits and vegetables groups was not different for cystatin C–estimated GFR (21.7±3.4 versus 21.6±4.6 ml/min per 1.73 m2, respectively; P=0.87) and creatinine-estimated GFR (23.0±3.5 versus 22.8±4.9 ml/min per 1.73 m2, respectively; P=0.84) (Figure 4). Similarly, 1-year eGFR was not different between the HCO3 and fruits and vegetables groups for cystatin C–estimated GFR (20.3±3.2 versus 20.7±4.7 ml/min per 1.73 m2, respectively; P=0.41) and creatinine-estimated GFR (21.4±3.3 versus 21.9±5.1 ml/min per 1.73 m2, respectively; P=0.32). 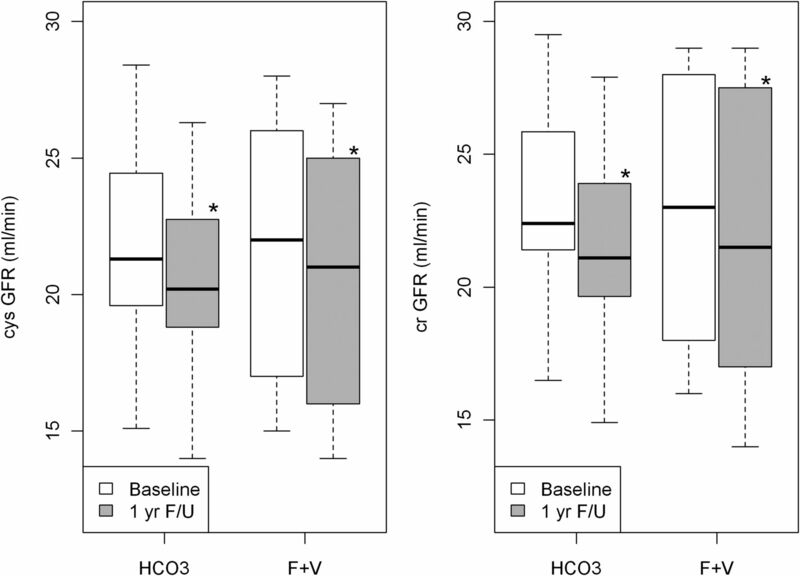 Box plots of plasma cystatin C–estimated GFR (cysGFR) (left) and of plasma creatinine–estimated GFR (crGFR) (right) at baseline and 1-year follow-up. The bottom and top of the boxes span the 25th and 75th percentile of data points. The dark bar within the box indicates the 50th percentile or median. The whiskers indicate 1.5 times the interquartile range from the lower and upper quartiles. F+V, fruits and vegetables; F/U, follow-up. *P<0.05 versus respective baseline. Baseline values for 8-hour urine excretion of albumin for the HCO3 and fruits and vegetables groups were not different (P=0.70), and 1-year compared with baseline 8-hour urine albumin was lower in both the HCO3 (P<0.01) and the fruits and vegetables (P<0.01) groups (Figure 5). In addition, 8-hour urine albumin was higher in patients receiving HCO3 than in those receiving fruits and vegetables at 1 year (P=0.02). Baseline 8-hour urine UNAG for the HCO3 and fruit and vegetable recipients was not different (P=0.84), and 1-year compared with baseline 8-hour UNAG was lower in both the HCO3 (P<0.01) and the fruits and vegetables (P<0.01) groups. In contrast to urine albumin, UNAG in the HCO3 and fruits and vegetables groups was not different at 1 year (P=0.68). Baseline 8-hour UTGF for the HCO3 and fruits and vegetables groups was not different (P=0.95), and 1-year compared with baseline 8-hour UTGF was lower in the HCO3 (P<0.01) and fruits and vegetables (P<0.01) groups. UTGF in the two groups was not different at 1 year (P=0.64). Box plots of the 8-hour urine excretion of indices of kidney injury. Urine albumin (8h urine albumin) is in the left panel, urine N-acetyl β-d-glucosaminidase (8h UNAG) is in the middle panel, and urine TGF-β (8h UTGF) is in the right panel. The bottom and top of the boxes span the 25th and 75th percentile of data points. The dark bar within the box indicates the 50th percentile or median. The whiskers indicate 1.5 times the interquartile range from the lower and upper quartiles. F+V, fruits and vegetables; F/U, follow-up. *P<0.05 versus baseline; +P<0.05 versus HCO3. Baseline plasma [K+], 8h urine K+ excretion, and urine fractional K+ excretion (calculated using cystatin C–estimated GFR) were not different between groups (Table 1). At 1 year, plasma [K+] was lower than its respective baseline in the HCO3 group but was no different in the fruits and vegetables group. One-year 8-hour urine K+ excretion was higher than its respective baseline in both the fruits and vegetables and HCO3 groups and was higher in the fruits and vegetables group than the HCO3 group. In addition, baseline plasma [Na+], 8-hour urine Na+ excretion, and urine fractional Na+ excretion were not different between groups. In addition, 1-year values for 8-hour urine Na+ excretion and urine fractional Na+ excretion were lower in the fruits and vegetables group than the HCO3 group. Plasma [aldosterone] levels at baseline were not different between groups but at 1 year were higher in the fruits and vegetables group than the HCO3 group (Table 1). Eight-hour urine aldosterone excretion at baseline was not different between groups (P=0.52) but at 1 year was higher in the fruits and vegetables group than the HCO3 group (P<0.01) (Figure 6). One-year compared with baseline 8-hour urine aldosterone excretion was higher in the fruit and vegetable recipients (P<0.001) but was lower in the HCO3 recipients (P<0.01). Baseline ratio of urine excretion of active cortisol (THF) to its inactive metabolite (THE) was not different between the HCO3 and fruits and vegetables groups (P=0.69) (Figure 6). By contrast, 1-year compared with baseline THF/THE ratio was higher in patients receiving fruits and vegetables (P<0.01) but lower in those receiving HCO3 (P<0.01); the THF/THE ratio was inversely related to 11β-hydroxsteroid dehydrogenase type 2 activity (26). Box plots of 8-hour urine aldosterone excretion (8h aldo) (left) and ratio of active (tetrahydrocortisol [THF]) to inactive (tetrahydrocortisone [THE]) urine cortisol metabolites (right) in CKD stage 4 at baseline and 1 year. The THF/THE ratio indirectly assesses 11β-hydroxysteroid dehydrogenase enzyme activity that converts glucocorticoids to inactive metabolites. Higher ratios indicate lower activity. The bottom and top of the boxes span the 25th and 75th percentile of data points. The dark bar within the box indicates the 50th percentile or median. The whiskers indicate 1.5 times the interquartile range from the lower and upper quartiles. F+V, fruits and vegetables; F/U, follow-up. *P<0.05 versus respective baseline; +P<0.05 versus HCO3. These studies show that 1 year of dietary acid reduction with base-producing fruits and vegetables or oral NaHCO3 in individuals with metabolic acidosis and stage 4 CKD due to hypertensive nephropathy yielded eGFRs that were no different at follow-up. In addition, 1-year compared with baseline plasma TCO2 was higher and urine indices of kidney injury were lower in the fruits and vegetables and NaHCO3 groups, consistent with improved metabolic acidosis and reduced kidney injury. 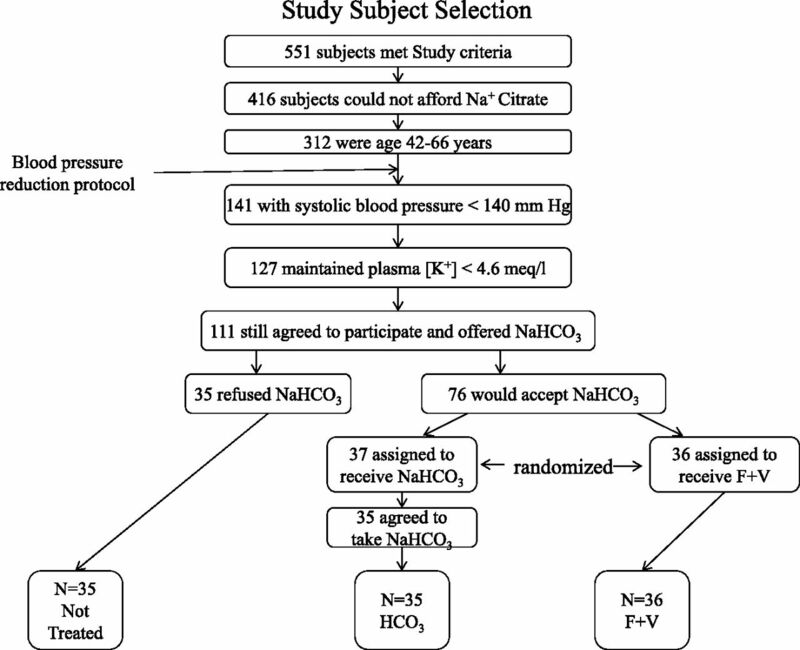 Added fruits and vegetables did not induce hyperkalemia and, unlike NaHCO3, was associated with reduced systolic BP. The data support fruits and vegetables as an effective alternative to Na+-based alkali to improve metabolic acidosis and reduce kidney injury in stage 4 CKD and suggest that fruits and vegetables be studied further as a potential kidney-protective adjunct to BP reduction and ACE inhibition in hypertensive nephropathy. Diets in industrialized societies are largely acid-producing because they are deficient in fruits and vegetables and contain large amounts of animal products (5,14,27). Such diets can induce metabolic acidosis in individuals with reduced GFR, including otherwise healthy elderly persons (28). Changing from standard industrialized society diets to a low-phosphorous vegan diet improved metabolic acidosis in patients with CKD who had a mean GFR of 16.1 ml/min per 1.73 m2 (13). In addition, added fruits and vegetables reduced urine NAE, consistent with reduced net endogenous acid production (28), in individuals with CKD stage 2 (eGFR, 60–89 ml/min per 1.73 m2) but without metabolic acidosis (9). Together, these studies suggest that added fruits and vegetables can improve metabolic acidosis in CKD. Nevertheless, 1-year plasma TCO2 was lower and urine NAE was higher in the fruits and vegetables group than the HCO3 group. This difference was probably due to higher alkali equivalents prescribed to the HCO3 patients than the fruits and vegetables patients (1.0 versus 0.4 mEq/kg per day) in complying with recommended NaHCO3 doses for such individuals (1) and our being conservative regarding the fruits and vegetables dose because of the augmented dietary K+. Nevertheless, fruits and vegetables recipients appeared to benefit, as determined by urine indices of kidney injury that were lower at 1 year than baseline. Whether higher amounts of fruits and vegetables yield even greater benefit without producing hyperkalemia awaits further study. This study shows that although the fruits and vegetables and HCO3 groups had systolic BP that did not differ, systolic BP at 1 year was lower in the patients receiving fruits and vegetables than those receiving HCO3. This lower systolic BP might have contributed to lower urine albumin at 1 year in the fruits and vegetables group (29). Starting a vegetarian diet in hypertensive individuals reduced BP (30), and fruits and vegetables are important components of the Dietary Approaches to Stop Hypertension (DASH) diet, which reduces BP in hypertensive individuals (31). At least three factors evident from the reported data might have contributed to lower systolic BP in patients receiving fruits and vegetables. First, these patients had lower urine Na+ excretion than did those who were not treated and HCO3 recipients, consistent with reduced Na+ intake that is associated with reduced BP (31,32), particularly in individuals with reduced GFR (33). Second, the fruits and vegetables group had increased urine K+ excretion, consistent with increased dietary K+ that is associated with BP reduction in individuals with hypertension (34). Third, the fruits and vegetables group lost more body weight than did the HCO3 group, probably contributing to BP reduction (35). As seen in a similar study (9), patients receiving fruits and vegetables but not those receiving HCO3 lost body weight. We attribute this weight loss to reduced caloric intake because the 3-day diaries in the fruit and vegetables group showed that these patients largely substituted fruits and vegetables (given free of charge) for higher-calorie, acid-producing foods that these largely impoverished families had previously purchased. Of note, urine creatinine excretion at 1 year was slightly but significantly higher than at baseline in the fruits and vegetables and HCO3 groups, consistent with a small gain in muscle mass in those patients. Because correcting metabolic acidosis in CKD improves nitrogen balance (36), we speculate that improved metabolic acidosis in fruits and vegetables and HCO3 individuals contributed to a net increase in muscle mass. We further speculate that the fruit and vegetable recipients lost more fat weight than they might have gained in muscle mass (because of the indicated decreased caloric intake) and that HCO3 recipients lost no weight because their caloric intake did not decrease, as suggested by their 3-day diaries. Further studies will be needed to test these hypotheses. Despite the benefits ascribed to fruits and vegetables, the associated increase in dietary K+ warrants caution in considering fruits and vegetables for individuals with low eGFR. An encouraging finding is that fruits and vegetables did not induce hyperkalemia in nondiabetic individuals with mean creatinine clearance of 16.1 ml/min per 1.73 m2 (13). In our study, plasma [K+] did not change significantly in the fruits and vegetables group, and no patient in any group had plasma [K+] levels > 4.6 mEq/L during follow-up. Nevertheless, study criteria probably excluded individuals at high risk for hyperkalemia, including those with diabetes (33) and those who remained normokalemic during prestudy observation. The latter probably excluded those with aldosterone deficiency, a common mechanism for hyperkalemia in individuals with reduced GFR (37). This study provides insight into how fruit and vegetable recipients increased urine K+ excretion and thereby avoided hyperkalemia in response to increased dietary K+ associated with fruits and vegetables. The K+ in fruits and vegetables is ingested predominantly with nonchloride anions, facilitating urine K+ excretion (38). Supporting the importance of the ingestion of nonchloride anions on urine K+ excretion, individuals given NaHCO3 without added K+ had a slight but significant increase in urine K+ excretion and a slight but significant decrease in plasma [K+]. In addition, urine aldosterone excretion, an index of aldosterone secretory rate (37), increased compared with baseline in patients receiving fruits and vegetables despite ACE inhibition. Higher urine aldosterone excretion might indicate that higher kidney aldosterone should promote distal nephron K+ secretion, particularly with nonchloride anions in the distal nephron lumen. In addition, the 1-year compared with baseline urine THF/THE ratio was higher in the fruits and vegetables group but lower in the HCO3 group. These data suggest that fruits and vegetables decreased 11β-hydroxysteroid dehydrogenase type 2 activity in the fruits and vegetables group, allowing glucocorticoid access to the mineralocorticoid receptor with added stimulation of distal nephron K+ secretion (26). In conclusion, individuals with stage 4 CKD undergoing 1 year of dietary acid reduction with base-producing fruits and vegetables or oral NaHCO3 had higher-than-baseline plasma TCO2 and lower-than-baseline urine indices of kidney injury, consistent with improved metabolic acidosis and reduced kidney injury, respectively. Although fruits and vegetables did not increase plasma [K+], study patients were selected to be at low risk for hyperkalemia and clinicians should exercise caution in prescribing fruits and vegetables in patients with very low eGFR. Nevertheless, treating metabolic acidosis in individuals with stage 4 CKD due to hypertensive nephropathy with fruits and vegetables or NaHCO3 appears to be an effective kidney-protective adjunct to BP control with regimens including ACE inhibition. We thank the nursing, dietary, and clerical staff of the Department of Internal Medicine at Texas Tech University Health Sciences Center for their assistance and the Inside Out Community Outreach Program and Food Bank of Lubbock, Texas, for making these studies possible. This work was supported by funds from the Larry and Jane Woirhaye Memorial Endowment in Renal Research the Texas Tech University Health Sciences Center, by the Statistics Department of Scott and White Healthcare, and by the Academic Operations Division at Scott and White Healthcare. See related editorial, “Treatment of Acidosis in CKD,” on pages 342–343.